It appears I haven't been keeping up with Imperial State Electric. Guess I should move to Sweden to get more reliable band updates. It seems that ISE has released two more albums since I last review their eponymous debut album. 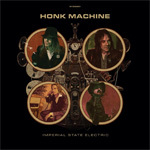 Hellacopters veteran guitarist Nicke Andersson and his faithful crew return with their fourth album Honk Machine. 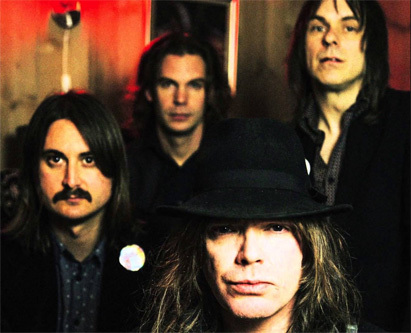 In one sense, Imperial State Electric has been an extension of The Hellacopters, especially if you look at the comments made on social media by fans of both bands. But then it's a familiar formula for Imperial State Electric. Slip back into the classic rock coat circa sometime between the mid-Sixties to mid-Seventies, adding a strong influence of guitar rock and power pop. The sound is anything from The Beatles to The Raspberries, Rolling Stones to early Alice Cooper, maybe with brevity and rawness of KISS, even early punk. In this motif, Honk Machine is a study in contrasts. Their sound is bigger now, more loud, even more lush, yet equally stripped down and skeletal. Maybe that's how they built these songs. Start from with the bones of analog and tube amps and then add the flesh of brisk guitars, bold melodies, and vivacious vocal harmonies. Whatever the scenario, it's working. It's depth and richness, wrapped in brevity. Power guitar pop in three or so minutes or less. I'm guessing if any or all these songs were played in succession, along with others from the ISE catalog, in a live setting, heads would spin and minds would be blown. While most songs slide easily into the aforementioned description, there are two songs of interest. One is Walk On By, a ballad that moves with a groove and feeling somewhere between soul and country, maybe even some blues from the guitar solo. Then there's It Ain't What You Think (It's What You Do), a fast and heavier song, the longest here, that doesn't slow once it starts. It's like a bolt forward from those earlier decades to something Eighties. Basically, with Honk Machine, it's all good. 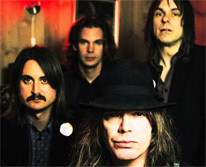 Imperial State Electric is easily in their rock n roll groove once more. And the young alt and indie cats could learn a thing or two about making catchy rock songs from this band. Recommended. Basically, with Honk Machine, it's all good. Imperial State Electric is easily in their rock n roll groove once more.